So the Hilton Anatole just finished building an amazing resort pool complex called JadeWaters. It is MASSIVE! They have a swim-up bar and a pool area that’s more adult only-ish, but then there’s tons of different play areas to bring your kids too as well. They also have a lazy river, and I really yummy menu to order from. We spent almost all day Saturday at the pool! Friday night we had dinner at Mercat Bistro in the Harwood District – one of our favorite Dallas date night spots! 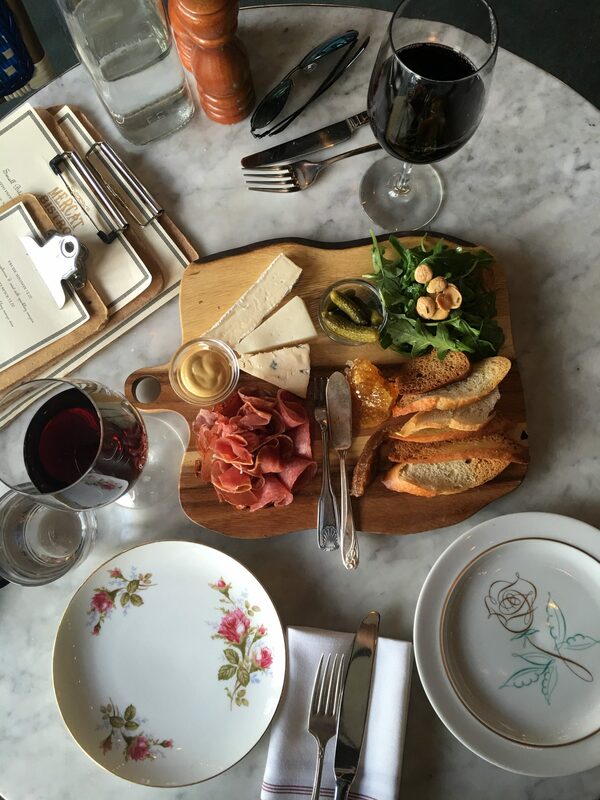 I’m obsessed with their beautiful dishes, marble tabletops, and of course the amazing food and wine! And we’ve always had the best service there. I can’t say enough good things about this restaurant – definitely a must if you’re coming to Dallas for the first time! One of mine and Michael’s favorite parts about being on vacation is getting to work out together! We walked to the fitness at the Hilton Anatole on Saturday before hitting up the pool, and got in an hour workout together. It’s so nice to have a workout buddy, and also be able to work out whenever you want, without a schedule dictating how much time you have! What do y’all think of doing a staycation? Up until about a year ago I’d never tried it before, but now I am ALL for them! I think it’s an inexpensive (cheaper than flying somewhere) way to get out of your normal routine, and spend quality time with either your spouse, a best friend, your mom, or your sister! Hope this little Dallas staycation guide helps you out either on your next trip to Dallas, or sparks an interest to plan a staycation of your own! I LOVE the idea of a staycation! I definitely need to do them more, especially living here in Santa Barbara 😉 thanks for the great idea! It sounds like you guys had such a great time! I love staycations! Definitely need to do this more often! Your style is awesome. I haven’t try a staycation before, might think about it since there are so many places to visit here is Australia (and it takes long hours drive to reach).